Last week Siany waxed lyrical about what makes a perfect cheeseboard. Cor blimey, it was a good guide, and one piece of advice in particular caught my eye: when choosing your board, you should always pick a cheese you've never heard of/ tried. Ah yes, many a favourite has been discovered by this method, and I now pride myself - and my cheeseboard - as being up for anything you decide to bring to the table. I'm quite a fan of cheese with stuff in it. Apricots, chilli, chives - you name it, and now I'm dead set on the next 'mystery cheese' to grace my board: nettle cheese. 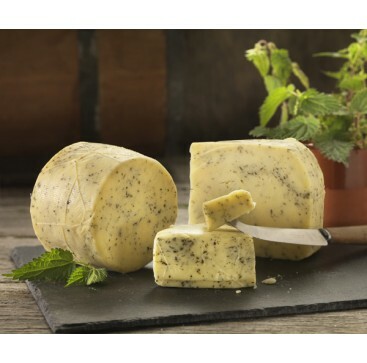 The delicious Northumberland Cheese Company have come up with this corker: creamy Northumberland Original infused with fresh nettley goodness. The Northumberland Cheese Company measure their cheese by the wedge, which I adore. Wedge is the best word to use when describing how much cheese you want. Three quid for new cheese. Mega. this is the best cheese in history.